If you’ve ever had classic pierogi (and even if you haven’t) you’ll be blown away by our pierogi lasagna. Traditionally, pierogi are dumplings from Eastern Europe filled with potatoes, cheese, and a variety of meats and veggies. While they are extremely delicious, making the dough and hand-forming each dumpling can be time and labor-intensive. In our quest to simplify the pierogi process, we have discovered that regular lasagna noodles provide a very similar taste and texture, with a whole lot less work! This lasagna is so easy to make, and with tons of melty cheese and buttery mashed potatoes, it’s the epitome of comfort food. We’re super excited about this yummy recipe hack and can’t wait for you to try it! It’s so delicious, I’m sure I’ll be making it once a week for my family! They can’t get enough. Preheat oven to 375ºF and grease a 9x13 inch baking dish with butter or nonstick spray. Cook lasagna noodles according to package directions, and set aside. In a large skillet add onion, butter, salt, and pepper. Saute on medium heat until soft, about 10 minutes. Place 4 lasagna noodles in an even layer on bottom of baking dish. 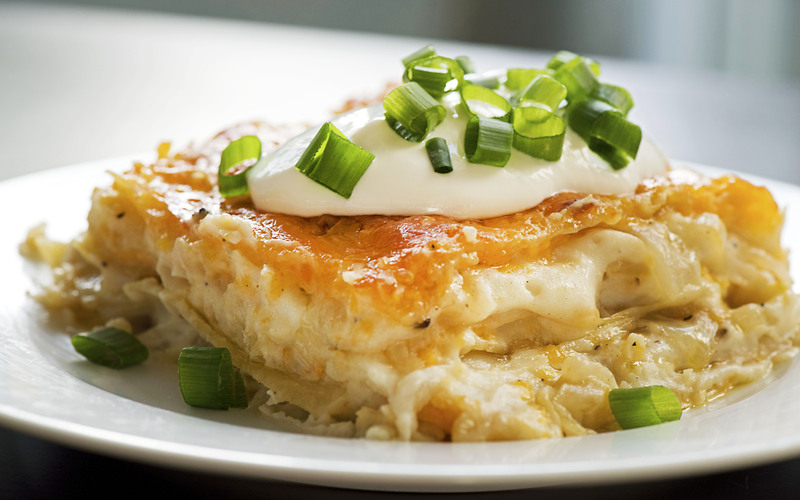 Layer ½ of total mashed potatoes on top of noodles, followed by ½ of the sauteed onions, and ½ cup of cheese. Repeat with another layer of lasagna noodles, remaining mashed potatoes, sauteed onions and ½ cup cheese. Top lasagna with remaining 4 noodles and 1 cup cheese. Bake for 30 minutes or until hot and bubbly. Serve hot and enjoy!